Undersea topography and currents combined with rising sea levels make Roches Beach one of Tasmania’s most vulnerable coastlines. Insurance companies are really starting to feel the heat in the wake of last summer’s Queensland and NSW floods, not to mention Tasmanian and Victorian bushfires. Insured losses from river and coastal flooding last summer amount to over $1 billion, on top of huge bills outstanding from previous years’ events. A couple of weeks ago Andy Cornish, head of the Insurance Australia Group’s direct insurance division, complained that his and other insurance companies are “wasting millions of dollars” trying to get a handle on how climate-related hazards are trending over coming decades. Cornish identified surging seawater, pushed by winds and tide during coastal storms, as a major problem area: “Storm surge has not been modelled anything like as sophisticatedly as floods.” He believes data on such phenomena should be pooled by governments and made public. He’s right to be concerned — storm surge is an increasingly telling factor in damage to coastal properties during big wind-rain events — but he should have done more homework before going public about the lack of modelling. “Canute”, a Tasmanian-based website initiated by oceanographer John Hunter and hosted by the Antarctic Climate and Ecosystems CRC, provides data on storm surge and sea level around Australia spanning the 21st century and tailored to current local needs. Canute combines information from modelling of future sea-level with actual tide-gauge data on past storm surges to calculate the probability of flooding in a given location around the Australian coast in any given future year. If Cornish wants to see more information in the public domain, he would do well to get his company to re-direct some of those wasted “millions of dollars” towards this world-leading modelling tool, produced by people prepared to put in huge effort for little financial return. Science is no longer a salaried career for John Hunter, but his retirement last year has given him time to focus on what he’s most passionate about — getting his knowledge about what’s happening to the oceans out into the public sphere. He’s concerned that there’s not enough allowance for uncertainty in existing estimates of the amount by which we need to raise coastal infrastructure to cope with future inundation by the sea, and is looking at how the modelling data can be better applied to practical situations. His new technique, now adopted by the Tasmanian government, uses what he calls a “likelihood-preserving” allowance, which will apply to all coastal development proposals submitted for approval around the state. The new allowances require proponents to show that their development would resist sea-level rise by demonstrating that it would experience the same likelihood, or frequency, of flooding events under projected future sea-level rise as it would if the sea were at current levels. 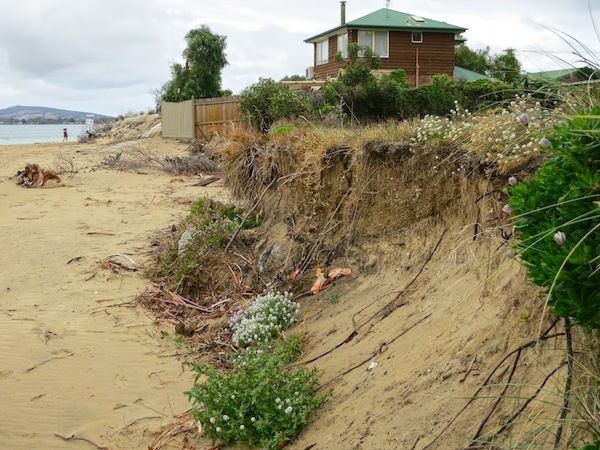 The new allowances have been included in coastal inundation hazard maps being developed by the Tasmanian government with the help of Hunter and other consultants, including Hobart-based coastal geomorphologist Chris Sharples. Sharples, whose mapping of vulnerable coastlines around Australia has given him a national profile, is helping to identify high, medium and low hazard zones for flooding and coastal erosion and to establish where and how far the hazard zones need to be extended inland. Getting a handle on future sea levels is the basis of a multi-pronged Tasmanian government program to manage hazards caused by coastal inundation and erosion. Besides establishing sea level rise planning allowances, the program seeks to mitigate natural hazards through land-use planning, and to develop a coastal hazard area code and a coastal protection and planning framework. There’s another element of the coastal management story in Tasmania, involving Hunter, Sharples, surveyor Nick Bowden and a host of volunteers. This is TASMARC, a shoreline monitoring project in which volunteers regularly measure beach profiles. TASMARC, which has already provided useful data, has the long term purpose of detecting when beaches shift from relative stability into progressive recession in response to sea-level rise, a condition already reached by Roches Beach and probably beaches on Tasmania’s south-west coast. I take pleasure in reporting these developments. For too long we have seen governments everywhere dragging their heels on climate change issues. While these issues have struggled to get public attention, they are becoming more pressing as each year passes. The Tasmanian government’s sea level rise programs are a shining example of what can be achieved with little fuss, fanfare or financial cost, taking full advantage of Tasmania’s climate science expertise and drawing on the dedicated labour of volunteers. They’re far from finished yet, but the programs are building a bank of high-quality data that will inform policy and planning decisions well into the 21st century. It’s unclear what the 2014 election might bring, but I can’t imagine any new government wanting to ditch such cost-effective work. Incidentally, in case you’ve heard that sea level is barely moving, I’m afraid it’s continuing to rise at or above the record rates seen in the 1990s. That is, around 3 cm a decade, or ten times one widely-touted rate of 3.2 cm a century. This entry was posted in changes to climate, climate politics, climate system, coastal management, contrarians, economic activity, economic threat from climate, land use, marine sciences, science, sea level, Tasmanian politics and tagged Andy Cornish, Canute, changes to climate, Chris Sharples, climate politics, climate system, coastal management, contrarians, economic activity, economic threat from climate, Insurance Australia Group, John Hunter, land use, marine sciences, Nick Bowden, science, sea level, Tasmanian politics, TASMARC. Bookmark the permalink.